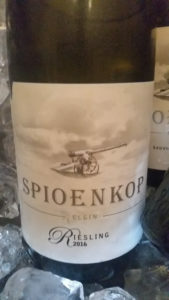 If great Pinot Noir out of South Africa is elusive, then great Riesling even more so. Koen Roose of Spioenkop in Elgin, however, has made one the best examples of local Riesling yet in the case of his 2016, the analysis something special to start with: Alc 12.5%, RS 3.4g/l, TA 8.0g/l and pH 3.1. The nose shows lime and green apple with some citrus blossom and spice in the background. The palate shows terrific concentration and driving acidity before a pithy finish. It has both an intensity and raciness really achieved here and should mature extraordinarily well. Approximate retail price: R230 a bottle. I haven’t tried the 2016, but I’ve had the previous vintages. I think he is producing the best dry Riesling in SA. The only Riesling which can stand up to the relatives in Germany and Austria. What I like especially is the low level of alcohol he keeps in his Riesling.